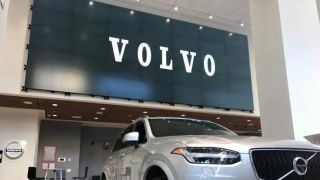 When Volvo bought space along New York City’s Eleventh Avenue, aka “Auto Row”—where showrooms for major automobile manufacturers stretch from 40th Street to 60th Street—the goal was to build an attractive brand awareness center that stops passersby in their tracks. Featuring a huge 5x7 panel video wall, a virtual-reality vehicle design room, five zones of audio, a Swedish-design inspired coffee lounge, and an advanced ClearOne VIEW Pro IP-based video delivery solution that enables custom video sizes and remote management, the Volvo storefront stands out among competing local showrooms. According to Nick Ehr, owner of Florida-based electronics integration firm Broadcast Systems, Volvo knew the capabilities and aesthetic appeal they wanted, but beyond that, the decisions on equipment and system design were left to the professionals. Another crucial requirement of the project was reliability and remote accessibility, particularly since the integration firm is located 1,000 miles from the job site. "During the 18-month project period we traveled to New York each month to attend meetings and ensure every detail was considered and every concern was addressed,” Ehr added. “We loaded the software on the server, so all the ClearOne pieces talk to the server. Now I can log into it remotely to check the temperature of all the displays, and if anything does get hot, the system immediately sends us an email. We can remotely update firmware, power cycle, adjust color temperature, add sources, and much more." The video distribution solution uses a single ClearOne VIEW Pro E120 Encoder to send signal to 35 ClearOne VIEW Pro D210 decoders, one for each panel on the 5x7 video wall. The ClearOne VIEW Pro PANORAMA software and CONSOLE software allow operators to manage displays of any shape, size, or resolution, which is becoming more important as companies opt for custom LCD and LED video walls that don’t have standard pixel counts or aspect ratios. The showroom’s general manager, Nelson Guerrero, was open about the store focusing more on brand awareness than sales, specifically noting that exciting video content can extol the brand’s values—family, safety, technology, design—in a way that no static advertisement or vehicle showcase can match. He also cited the benefit of using advanced display solutions to reach today’s consumers, based on the overwhelming role digital displays now play in our daily lives. Broadcast Systems also installed a special color management tool that allows the integrator to adjust the color temperature and image specifications for the video wall. The wide range of custom capabilities ensures every future need can be met with minimal labor or hardware changes. The ClearOne system also manages content for two additional flat screen HDTVs in the showroom.